We love the hand-tooled patterns in the dyed leathers of these bags, the cutout designs, and joining of colors to create an unmistakable look. 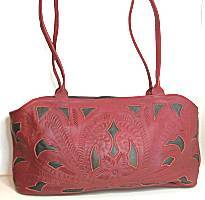 The leather is sturdy cowhide, vegetable dyed, with stitched details in assembly. Designed by Ricardo Zuniga, the designs are definitely inspired by the American West. Made in Paraguay. Wonderful leather wallet, 8-1/4 x 4-1/4 x 3/4 inches, has metal zipper around 3 sides. 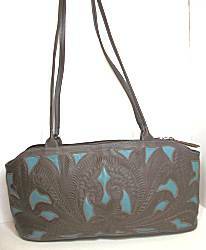 The leather has a rustic finish with tooled leafy design, highlighted by a black wash in the aqua turquoise color. Wrist strap is detachable. Inside lined in black/gold signature fabric with lots compartments formed in leather. There are 4 full open slots for bills or receipts. 10 slots for credit cards. Center zipper pocket. Outside is a 3/4 length pocket for more handy items. 8-1/2 x 9 x 1-1/2 inches, this can be fairly flat depending on personal items stashed inside. 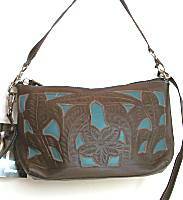 The leather has a rustic appeal with intricate leafy tooled pattern, aqua turquoise color highlighted with dark wash. On the front is a full pocket opening that closes with center snap. Tassel is tied to cinch in the leather like a graceful pleat. Full metal zip top with braided pull. Interior lined with black/gold signature fabric, there is an open cell phone pocket, and a zipper pocket. 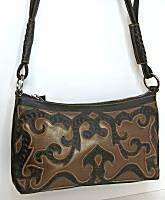 Long 3/4 inch flat shoulder strap has buckle to adjust length up to cross body. Hardware is antiqued brass. Wonderful leather wallet, 8-1/4 x 4-1/4 x 3/4 inches, has metal zipper around 3 sides. 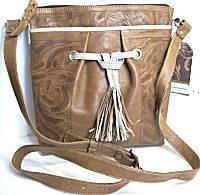 The leather has a rustic finish with tooled leafy design, saddle tan color. Wrist strap is detachable. Inside lined in black/gold signature fabric with lots compartments formed in leather. There are 4 full open slots for bills or receipts. 10 slots for credit cards. Center zipper pocket. Outside is a 3/4 length pocket for more handy items. 8-1/2 x 9 x 1-1/2 inches, this can be fairly flat depending on personal items stashed inside. 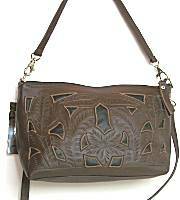 The leather has a rustic appeal with intricate leafy tooled pattern, tonal saddle tan color. On the front is a light sand/bone leather trim for full pocket opening that closes with center snap. Tassel is tied to cinch in the leather like a graceful pleat. Full metal zip top with braided pull. Interior lined with black/gold signature fabric, there is an open cell phone pocket, and a zipper pocket. 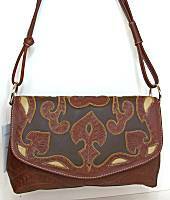 Long 3/4 inch flat shoulder strap has buckle to adjust length up to cross body. Hardware is antiqued brass. 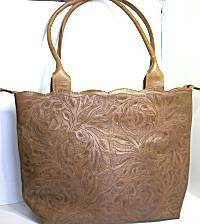 Horizontal short tote shape measures 14 x 7-1/2 x 3-1/2 inchs, made in rustic looking leather with leafy tooled pattern. The color is tonal light sand/bone. Square bottom, room for lots of personal items as bag flares outward a little. Scallop trim top hides the full metal inset zipper that has braided pull. Interior lined in signature black/gold fabric. Divided by a full length zipper compartment. On one outer wall is cell phone pocket, on the other is a smaller zipper pocket. Dual 24 inch leather-wrapped shoulder straps are firmly curved in shape. Wonderful leather wallet, 8-1/4 x 4-1/4 x 3/4 inches, has metal zipper around 3 sides. 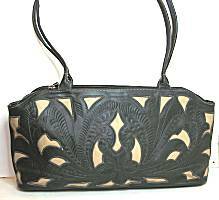 The leather has a rustic finish with tooled leafy design, light sand/bone color. Wrist strap is detachable. Inside lined in black/gold signature fabric with lots compartments formed in leather. There are 4 full open slots for bills or receipts. 10 slots for credit cards. Center zipper pocket. Outside is a 3/4 length pocket for more handy items. Handy smaller bag measures 10 x 6 x 2-1/2 inches. It offers a trio of neutral colors and an everyday style. Basic bag is tooled leather dyed a warm cognac brown. A flap over 3/4 of the front offers cutouts in the cognac to reveal smooth dark espresso brown and ivory beige leather underneath. Flap closes with a snap, with full zip top to secure contents inside, that gives you the option of using the zipper or just securing with flap's snap. Interior lined in black/gold scroll fabric with small zipper pocket. 26 inch shoulder strap is a double folded leather with wrap accents, attached by chrome rings to bag. This has more features than immediately meet the eye! Measures 14 x 7 x 4 inches. The dark tomato red leather on top has tooled patterns, cutout to reveal the dark walnut/almost-black bronze leather underneath. Topstitch detailing. Both front and back have a large open compartment that is closed simply with a snap, each lined in black/gold scrolling fabric. Full zip top over the larger center compartment, that has the same lining. Interior has 2 zipper pockets, a cell phone pocket, and 3 slots for credit card/ID items. Dual 28 inch shoulder straps are leather-wrapped cord, very soft and flexible. This has more features than immediately meet the eye! Measures 14 x 7 x 4 inches. The black leather on top has tooled patterns, cutout to reveal the dark turquoise leather underneath. Topstitch detailing. Both front and back have a large open compartment that is closed simply with a snap, each lined in black/gold scrolling fabric. Full zip top over the larger center compartment, that has the same lining. Interior has 2 zipper pockets, a cell phone pocket, and 3 slots for credit card/ID items. Dual 28 inch shoulder straps are leather-wrapped cord, very soft and flexible. This has more features than immediately meet the eye! Measures 14 x 7 x 4 inches. 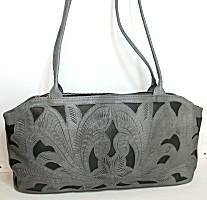 The black leather on top has tooled patterns, cutout to reveal the ivory/light beige leather underneath. Topstitch detailing. Both front and back have a large open compartment that is closed simply with a snap, each lined in black/gold scrolling fabric. Full zip top over the larger center compartment, that has the same lining. Interior has 2 zipper pockets, a cell phone pocket, and 3 slots for credit card/ID items. Dual 28 inch shoulder straps are leather-wrapped cord, very soft and flexible. Read about what others think of Leaders in Leather! Instead of reviews for a specific product, this is a place to share about the designer line in general.